Sun for Everyone! Even if you live in the shade, or rent your home, you can contribute to an installation in the sun! One of the main advantages is lower costs: You don’t have to buy a whole system at once; you can go solar in bite-sized purchases. For more examples of Community Solar projects, see the “Guide to Community Solar” that Spark Northwest authored for the National Renewable Energy Laboratory. Community solar provides an opportunity for people to directly benefit from the energy and incentives available. Participants may receive electricity bill credits for the power produced by their “share” of a system as well as an added incentive, depending on where the live and what their State or utility offers. Participants reap these benefits, while knowing that they are supporting clean, local solar power and highly visible community installations! Washington is a pioneer in Community Solar with 76 community solar systems installed between 2010-2016. 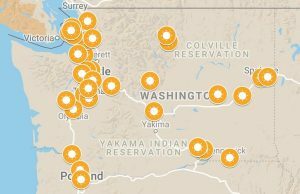 From Poulsbo to Kennewick, 36 cities are home to community solar projects. Click on the below map to see where active projects are operating in the state. How Can I Get Involved in Community Solar? Spark Northwest continues to provide program assistance to communities and utilities seeking to develop Community (or shared) Solar Programs. To learn more, contact us at: connect@sparknorthwest.org. Despite a reputation for rain, Seattle is a great place for solar energy – and Spark Northwest partnered with Seattle City Light to make solar energy more accessible and affordable than ever! Together, we designed and deployed an award-winning Community Solar program. 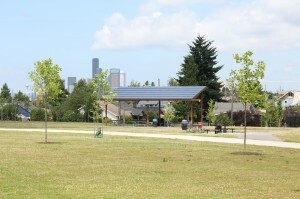 The first installation, three solar picnic shelters at Seattle’s Jefferson Park, enrolled over 450 residents, demonstrating Seattle’s strong support for harvesting the sun. The second installation, on the roof of the Seattle Aquarium, was even more popular! At $150 apiece, each solar unit is sized to return at least $150 to the customer over the life of the program. The third project at Phinney Neighborhood Association and the Woodland Park Zoo fully enrolled in the summer of 2014. The fourth project at Holiday Apartments in the Capitol Hill Eco-District sold out in 2015. Seattle City Light’s Community Solar program exemplifies how a large municipal utility, with some of the lowest customer rates in the nation, can develop a program that increases customer engagement and access to solar. In fact, the program won a 2012 Innovation award from the Interstate Renewable Energy Council, and new programs using the City Light model are springing up across the nation. Congratulations, Seattle City Light!